At the end of World War I, Canada was poised on the brink of social revolution. At least that is what many Canadians, inspired by the success of the Russian Revolution in 1917, hoped and others dreaded. Seeing Reds tells the story of this turbulent period in Canadian history during the winter of 1918–19, when a fearful government led by Prime Minister Robert Borden tried to suppress radical political activity by branding legitimate labour leaders as "Bolsheviks" and "Reds." Canada was in the grip of a widespread Red Scare promoted by the government and the media in order to discredit radical ideas and to rally public support behind mainstream political and economic policies. The story builds toward the events of the Winnipeg General Strike in May–June 1919 when the authorities, believing that the expected revolution had begun, sent soldiers into the streets to put down with force a legitimate labour dispute. 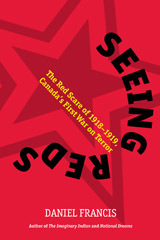 Author Daniel Francis examines Canada's Red Scare in a global context, including government responses to similar activities in the United States and western Europe, as well as its ramifications for the contemporary war on terror, in which issues of free speech and political dissent are similarly compromised in the name of national security. Based on government documents and first-hand accounts by the participants themselves, Seeing Reds is a gripping account of a little known episode in Canadian history. I first became interested in the Red Scare about thirty years ago when I was living in Ottawa and was able to do research in the records of the RCMP and other Canadian security organizations at the National Archives. What sparked my initial interest in the subject was the notion that anyone had ever feared a Bolshevik revolution in Canada. The idea seemed so preposterous. But when I came to understand the context of the period -- post-war idealism, international revolution, elite paranoia -- it began to make more sense. For a long time I waited for someone else to write a book about the Scare and though many fine books were written about aspects of the era I finally decided to write my own about the Scare itself and the way it seemed to set a precedent for many of the anti-radical "panics" that have occurred since. Seeing Reds is an entertaining, thoughtful, and disturbing book. Well-researched and written with style, it will inform and alarm readers. Daniel Francis brings together the skills of the historian with those of the storyteller to deliver a cautionary tale that is as much about the present as the past. Francis presents a vivid picture of sharp class and political struggles across Canada during the early 20th century … The details make for compelling reading.